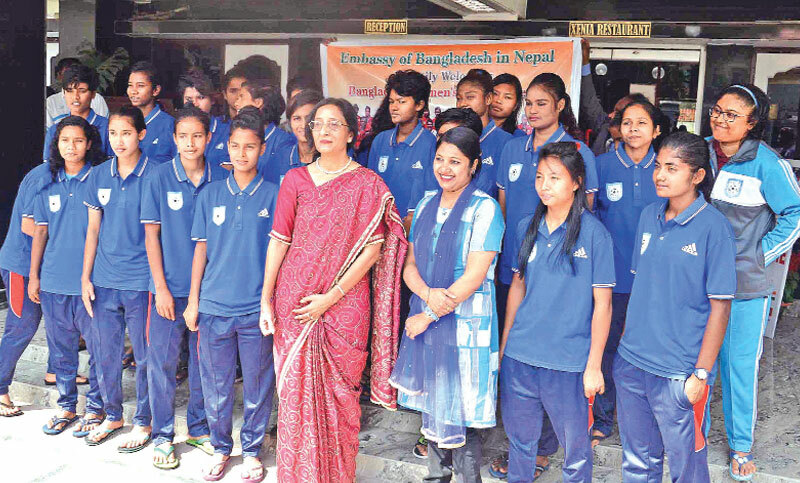 Bangladesh’s Ambassador in Nepal Mashfee Binte Shams on Monday paid a surprise visit at Xenial Hotel to motivate the Bangladesh National Women’s Football Team ahead of the Bangladesh’s semi-final clash of the SAFF Women’s Championship. Bangladesh will meet against India in the second semi-final of the six-nation SAFF Women’s Championship at the Shahid Rangashala in Biratnagar, Nepal at 3:00pm (BST). Mohammed Al Alamul Emam (Councilors and Head of Chancery) and Mahbubul Haque (First Secretary) from the Bangladesh Embassy in Nepal were also present during the visit. A warm reception by both party were greeted with exchange of gifts and flowers and well wishes. The brief reception was attended by all players, staffs, officials and dignities from the Bangladesh Embassy. Meanwhile, Bangladesh team is looking forward to the semi-final against India with a high leaving behind their shock defeat against host Nepal in the group phase match. Earlier, Bangladesh reached the last four stage of the meet as the Group A runners-up losing to hosts Nepal by 0-3 goals in their second match after beating Bhutan by 2-0 goals in the first match while India storm into semi-final as Group B champion with all-win record outplaying the Maldives by 6-0 goals and Sri Lanka by 5-0 goals.